2010, for me, hasn’t been a vintage year. No Yellow House, no Funeral, no You Forgot It In People, no Boxer. Some good albums, sure, but there was little that really grabbed me by the balls and forced me to listen. Here’s the first part of a three-part review of the year, with the first two featuring albums, and the last songs, gigs, and other stuff. You can sense this feeling in all those end-of-year lists that have been hosing around the web since the end of November (and, to whit, surely you should do your end of year list at the actual end of the year? No? Oh, just me, then). How many of them have actually agreed with each other on anything? Yes, you could argue that the lack of agreement between anyone this year shows a healthy and diverse musical scene, but you’d be wrong1. It just shows that no-one’s stepped up to the plate and made anything as thrilling, unusual, or just plain damn good as any of those records above. Out of all the records released this year, there’s been a load of records released by bands who have good form. Records that you’d expect to light up the year. But didn’t. Which leads me onto…. A whole bunch of records came out this year by some of my favourite bands. From the likes of The Hold Steady and Band of Horses, through to Arcade Fire and Sufjan Stevens, 2010 had the chance to be a bumper year. But for some reason they all turned out to be some shade of disappointing, ranging from “could do better B-“ for Arcade Fire to “See me after D-“ for Band Of Horses. The latter compounded a poor album with the kind of heavy handed blog bullying you’d expect from Metallica or some other horrendously uncool breadheads. The Hold Steady didn’t recover from the loss of Franz Nicolay, and their bread-and-butter-rock’n’roll-with-clever-lyrics just disappointed. Broken Social Scene returned after a pair of disappointing “BSS Presents…” albums with a proper BSS album that was also disappointing. 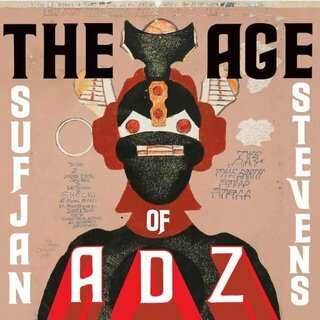 Sufjan Stevens came back with his take on Kid A – and I think about the same of it as I do Kid A. Overall, there’s lots of disappointment round here this year. For each of the bands who have been plain disappointing this year, there’s also been a bunch who have released new records that haven’t quite hit the heights of their previous records, but are still pretty good. So near, and yet so far. “Boxer” was enthralling and essential. “High Violet” is sporadically fantastic (“Bloodbuzz Ohio” and “Vanderlyle Crybaby Geeks”), but never quite reaches the peaks of “Boxer”. It’s a very good album, but not quite as good as you, I, and possibly the band themselves, know they can do better. So near, and yet so far. Etc. “Swim Until You Can’t See Land” burst in at the end of 2009 and nailed it as my favourite song of the year; I had high hopes for the album, especially after obsessing over the joyously glum Midnight Organ Fight. Nothing on it even comes close to matching “Swim”, sadly, so there’s a faint air of failure around this. Still good though, and well worth it if you’ve worn out your copy of Midnight Organ Fight. Or “How to grow old disgracefully”. If only other bands could reunite and make themselves as vital, as thrilling, and as plain cantankerous as this. See, The Pixies? This is how it’s done. Still not sure about this lot, despite repeated listening to this undoubtedly good record a whole bunch of times. The problem with deliberately being all clinical and precise is that you can lose the human touch. Then again, the precision has a certain allure that hasn’t tarnished with time, yet. Ten months on from its release, I’ve still hardly chipped into this record. Too bloody long. But that’s not to say that it doesn’t have its own sense of beauty, the coherent vision of someone who could safely be called a genius. In years to come, it may make more sense, or it might not, but I’d like to say it’s good now and be proved wrong, rather than the other way round. That’s it for the disappointments and partial successes. Join me tomorrow for the albums that I properly liked. Not that I didn’t like these ones. Oh, you know what I mean.